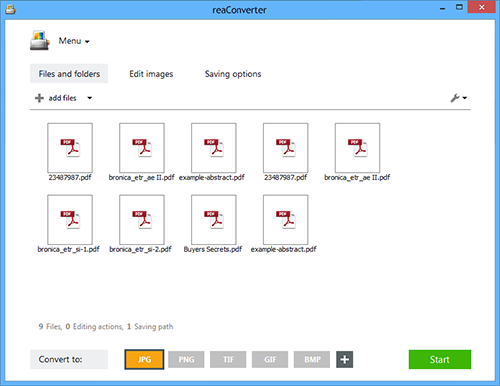 When converting vector files to a more accessible format with reaConverter's latest edition you can apply a series of handy customizing features. For example, in the case of PDF, EPS, EPI, PS and AI image files you can control the loading resolution and color resolution of the input files while preparing for conversion. 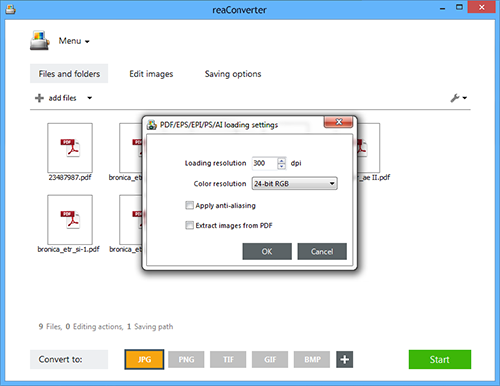 You can also apply anti-aliasing or extract image files from a PDF. Thus you save time and effort, as well as shape the process according to your needs when converting to raster formats. Load one or more PDF, EPS, EPI, PS or AI image files you intend to convert. You can add them manually from a local folder, add entire image file folders, or use the drag-and-drop tool. Next, pick a resolution of your choice for loading the input vector files. For example, if you don't plan to print the output files, but simply upload them online on a website or on an image sharing network, you can opt for a 72 dpi resolution. This will save time and space when converting, transferring and storing the output images. In this window you can also opt for a particular type of color resolution. Black-and-white, grayscale, RGB and CMYK are among the available options. Furthermore, you can tick the Apply anti-aliasing box and thus minimize the potential distortion caused by the changing in resolution, or the Extract images from PDF box if this is the case. Go to the Saving options section and pick a location for your output files. You can save them online or offline, in your storing cloud or in a customized local folder. 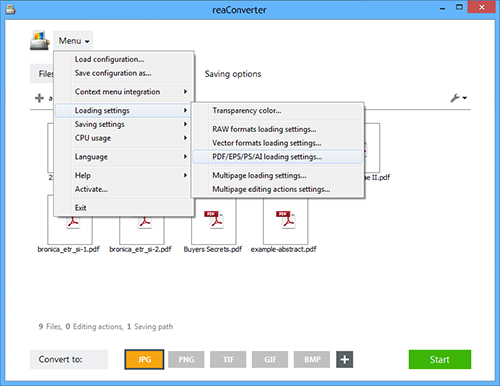 Last but not least, pick the format of the converted files from the buttons placed in the lower part of the screen. You can opt for a popular format, such as JPEG, PNG, TIF or BMP, or a less known one. 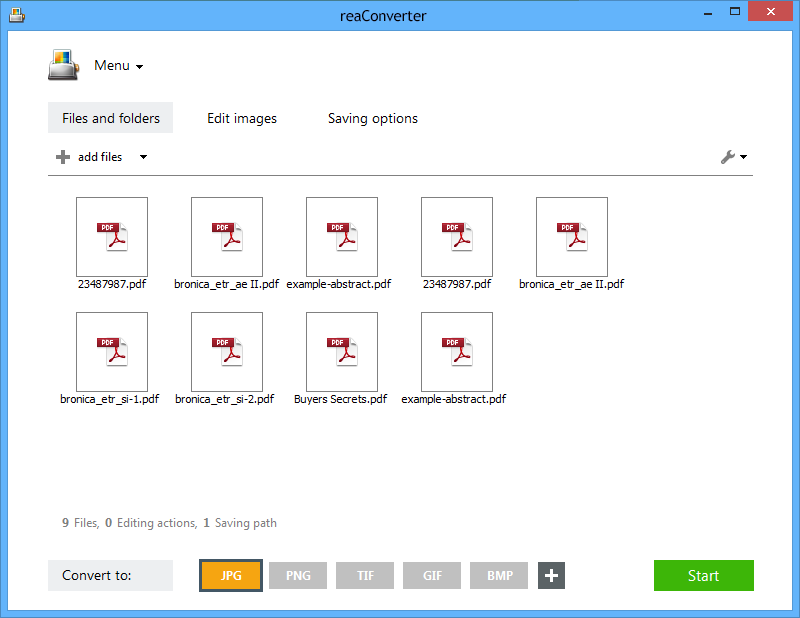 reaConverter supports just about any type of image format you can think of. Next, press the Start button and your newly converted files will be done in a few moments! Advanced users can do the same using command-line interface in manual or automated mode. You are welcome to contact our technical support when you have any questions about reaConverter.